La Linea del 20, the main title of the Bortolato Analogical Method, is now available in English! 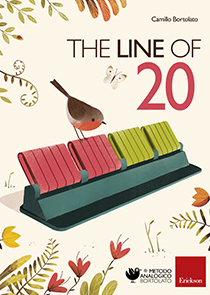 The Line of 20 – in its new, improved and coloured illustrated edition – is the alternative to coloured rods in primary school Maths teaching and also in the preparation steps at Kindergarten. It allows arithmetic operations within the number 20 and shows that these arithmetic operations are first of all simple and daily actions such as adding and taking away. Students use the tool as an extension of their own hands and as mental calculus in human beings has evolved through the use of hands, no other explanation is required. The Line of 20 is designed for students with difficulties in mental calculus, but has proven very helpful also with partially sighted or hearing impaired persons, and also with foreign students and at English international schools, in case of students whose linguistic competences need to be improved. It can also be a wonderful aid for parents who want to teach their children maths before their actual entry to school.